An interview, overview of events and analysis. 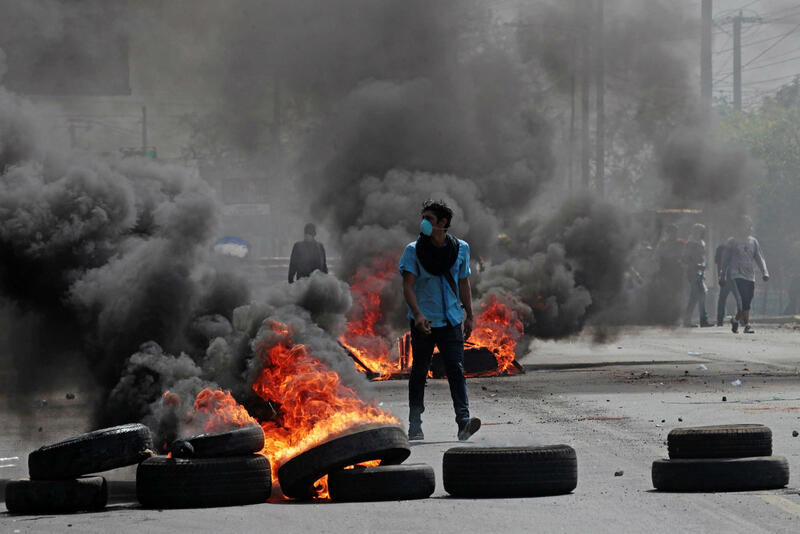 In April, a countrywide revolt broke out in Nicaragua against neoliberal reforms introduced by the government of Daniel Ortega, a Sandinista revolutionary from the 1980s. We worked with Nicaraguan anarchists who participated at the forefront of the movement to bring you the following interview, offering an overview of the events and an analysis of the difficulties of organizing against leftist authoritarian governments while resisting right-wing cooptation. The FSLN (Sandinista National Liberation Front) overthrew the US-backed military dictatorship of Somoza in 1979 and held power from 1979 to 1990. After 16 years of neoliberal governments, the FSLN returned to power in 2006, establishing an authoritarian administration that mixes socialism with neoliberalism, creating new economic elites while offering social support programs to the lower classes. The government is controlled by the presidential couple: President Daniel Ortega and his wife and Vice President, Rosario Murillo. The situation in Nicaragua right now reminds us of what happened in Brazil in 2013, when anarchists catalyzed a popular social movement against the neoliberal policies of the “left” government of the Workers Party. At first, this movement was pluralistic, including the anti-authoritarian horizontalism of the anarchists who started it and a vague popular opposition utilizing nationalistic symbols. Yet over the following years, as the police state cracked down on anarchists, right-wing reactionaries were able to take advantage of popular discontent to topple the Workers Party government and institute an even more reactionary administration. This provoked many people to rally to the same Workers Party that had originally betrayed them, sidelining anarchists and setting the stage for ever bloodier state repression. Apologists for the authoritarian left will use the events in Brazil as an excuse to delegitimize uprisings like the one in Nicaragua. But these uprisings are catalyzed by real problems. Defending left regimes as “the lesser of two evils” only ensures that people will continue to side with the other evil against them. We have to support popular uprisings in a way that opens a space for grassroots, horizontal movements to develop. All around the world, similar stories are playing out as authoritarian parties from the left and right attempt to monopolize the field of political possibility between them while implementing different versions of the same neoliberal agenda. Both sides benefit from reducing politics to this dichotomy. Because all the charges that each party levels against the others are absolutely true, each can point to the others’ misdeeds to rally support. So long as we can only imagine choosing between left and right parties, we will never be able to free ourselves of the hierarchies and injustices that both sides are determined to impose on us. Anarchists can identify several errors that can arise in popular uprisings. The discourse of “fighting corruption,” widespread from Nicaragua to Armenia, appears to offer a point of departure to build popular movements that are critical of the government. Yet in fact, by implying that government could function properly if not for the corruption of specific politicians, this discourse legitimizes government itself, distracting from the systemic problems created by capitalism and setting the stage for new politicians to replace the old ones in an endless cycle. That explains why this rhetoric has been so useful to demagogues like Donald Trump who charge their enemies with corruption in order to take power and do the same things themselves. Likewise, nationalism can appear to offer a platform for people to come together on a common basis against the authorities; think of the national flags that were widespread during the Arab Spring and Occupy movements, or the popular chant during the Egyptian revolution of 2011, “Muslim—Christian—We are all Egyptian.” Yet these old symbols always set the stage for new authoritarians to take power as the “true” representatives of the nation: remember how political parties like Syriza coopted and destroyed the movements of 2011, and how the Egyptian military took power in 2013 in a coup draped in Egyptian flags. In the coming years, anarchists and other participants in social movements will have to develop a more nuanced analysis of how to present a third option in the conflict between authoritarian leftists and right-wing nationalists. We will have to find ways to critique the neoliberal policies of left governments like those in Nicaragua and Brazil that do not play into the hands of right-wing neoliberals. This is one of the most pressing questions facing us today. Here follows the interview from our contacts in Nicaragua. Image: A barricade with a Nicaraguan flag. I am a part of an affinity group of six people. We’ve all worked together since 2015. The majority of us identify as queer; we are employed in very different sectors. Arts, culture, feminism, and politics brought us together. Both of my parents are historians. They both received their master’s degrees in History at the UNAN [Universidad Nacional Autónoma de Nicaragua, National Autonomous University of Nicaragua]. My mother is a feminist and my father is an ex-military poet. Throughout the events, I posted updates on my SoundCloud, starting here. You can find an archive of material we compiled during the events here. You can also search for the hashtags #OcupaINSS, #SOSINSS, #SOSIndioMaiz, and #SOSNicaragua on Twitter and Facebook. The first protest was a demonstration demanding immediate action from the authorities to extinguish a large-scale fire in the most important nature reserve in the country, Reserva Indio Maiz.1 The government did not listen to the protestors’ call to action, which was basically a demand to recognize the damage done by illegal cattle farms in indigenous territory. The fire lasted ten days; it was finally extinguished with the assistance of the military, indigenous volunteers, and international solidarity (e.g., a helicopter sent by Mexico). This environmental disaster ignited environmental and social activism, shedding light on the government’s colonial practices and on its resource-intensive neoliberal interventions in indigenous territories, such as promoting cattle grazing and monocrops like palm for palm oil. This movement was called #SOSIndioMaiz. It successfully organized three protests in the capital city, Managua. I participated in this organizational committee; it has now been dissolved, with several members creating other groups. To add to this social discontent, the Ortega Regime announced reforms to social security including an increase in contributions for employees and employers, a decrease in future pensions, and a fee from every retiree’s pension. The controversial reform was intended to save the social security institute from a deficit crisis. The INSS has repeatedly been accused of approving millions of dollars in private loans to government officials. Essentially, workers and retirees were to be forced to pay for the corruption and mismanagement of the social security funds (INSS). A previous social justice movement had emerged in 2013 under the name of #OcupaINSS. In response to the proposed social security reforms, this group of young organizers joined a group of elderly social security recipients who had started protesting because they were the ones who were going to suffer the most. The #OcupaINSS movement joined together with the #SOSIndioMaiz movement. Protests took place in two locations, in front of the Universidad Centroamericana and in Camino de Oriente(a plaza beside one of the busiest roads in Managua) on Wednesday, April 18. The government brutally attacked both of these protests, sending the police and its paramilitary forces (Motorizados2 and Sandinista Youth—see below) to attack the demonstrators. At 5 pm, anti-riot police (Anti-Motines) surrounded and dispersed protesters in Camino de Oriente. The protest in front of UCA escalated inside and around the University perimeters. More than 20 people were severely injured. The entire country mobilized in protest in response to the news of the previous night’s repression of #OcupaINSS in UCA and in Camino de Oriente. The government began censoring independent news channels on national television. They also ordered some hospitals not to aid wounded demonstrators. After the stations were removed from the airwaves, people followed them on social media. Pro-government mobs attacked students inside several university campuses. The following universities were closed and occupied by students. Nicaraguan police and members from the Sandinista Youth clashed with protestors inside and outside these facilities. Universidad Agraria (UNA) – A public university focused on agroindustry. They started in the morning, taking over the North Highway near the airport. Universidad CentroAmericana (UCA) – A semi-private university serving middle-class and upper middle-class student, recently criticized for restructuring their research and humanities departments. Universidad de Ingenieria (UNI) – A public university for engineering. UCA and UNI saw the most intense clashes at the beginning, after which the confrontations chiefly occurred around UPOLI. Universidad Politecnica de Nicaragua (UPOLI) – A public university. UNAN – The largest public university, with about 50,000 students; controlled by UNEN, the pro-government student “union.” UNAN has been a stronghold for UNEN. I live right in front of this university. Protests were reported all over the country. It was especially significant that protests took place in Monimbo, Masaya, Leon, Matagalpa, and Estelí, because they have been traditionally pro-government sites. The fact that resistance erupted there was a blow to the state and the power of UNEN. Granada and Leon are the most important tourist destinations in the country. The government had made several statements advocating for peace and dialogue as the police and Sandinista Youth violently attacked peaceful protestors. They would also set up PA systems to blast revolutionary songs and sing them together, protected by the police. This was the first time that a nationwide strike had occurred at this magnitude since the “6%” student protests in the late 1990s [described below]. Protests continued throughout the country as anti-riot police intensified their attacks. They raided locations where civilians were organizing medicine and food donations for protesters and stole them. At approximately 3 pm, the largest demonstration yet gathered in Carretera Masaya, one of the main roads in Managua. Paramilitary forces attacked using tear gas and rubber bullets. Later that night, in Managua, Sandinista Youth and police surrounded students and activists inside the cathedral, UNI (the national engineering university), and UPOLI (the polytechnic university). Police attacked Leon, where several buildings caught fire, including civilian households, a radio station, restaurants, and CUUN (the national university council of UNAN Leon). Masaya and Esteli were also attacked and occupied by paramilitary forces. In Granada, the city hall was burned down. Several people were killed and dozens reported missing. Confrontations continued throughout Nicaragua. There were demonstrations at several Nicaraguan embassies abroad. The government agreed to discuss social security reforms with COSEP, the private enterprise council. Many rejected the proposal, demanding that representatives from other organizations and movements be invited to the negotiations as well. At 12:30 pm, in his first address to the nation since protests began, Daniel Ortega called the demonstrators a “group of criminals and thugs that promote a culture of violence.” He did not mention the murders of activists and students, nor the censorship of television channels. Confrontations continued after Ortega’s address. Protests turned violent in several cities including Leon, Diriamba, Jinotepe, Matagalpa, and Chinandega. Students at UPOLI, the polytechnic university, continued protesting against police repression. The Nicaraguan army released a statement backing the government’s request for dialogue with COSEP, the private enterprise council, and demanding an end to police repression, the release of the detained students and activists, and the guarantee of free press without censorship. At 4 pm, the self-assembled movement, Movimiento Autoconvocado Nicaragua, released a statement demanding public negotiations including a variety of Nicaraguan sectors, labeling a dialogue between COSEP and the government a “pact.” As of 5 pm, the death toll was reported to be between 25 and 30, with 64 injured, 43 missing, and over 20 detained. As protests continued, looting took place around several cities. President Daniel Ortega addressed the nation for the second time, revoking the social security reforms in a televised announcement. He was accompanied by several top-ranking representatives from free trade zones in Nicaragua. Ortega briefly mourned the deaths of civilians, police, and journalists, without mentioning the violence of the Sandinista Youth and police. The president continued to describe protestors defending themselves as “thugs and gang members,” comparing them to looters. After his statement, another protest was called for; popular outrage had gone beyond the social security reforms to extend to violent repression and government corruption. Video: Daniel Ortega’s speech on April 22, complete with a letter from an English-speaker representing the business interests in Nicaragua. After Ortega’s address, people took the streets again demanding justice and mourning those who had been killed by the national police. COSEP demanded that the government take into consideration their proposed terms and conditions for a dialogue and negotiations to take place, and confirmed the march they had announced for the next day, Monday, April 23. At approximately 9 pm, students at the polytechnic university, UPOLI, reported being brutally attacked by the police while they were paying their respects to the fallen victims. Francisco Diaz, second in command of the national police, claimed that police forces were nowhere near UPOLI, despite accusations from students in the area. According to la Prensa, at least one student was killed and five injured by gunshots. Students at UPOLI confirmed the death of two students and about eleven injured from the previous night’s police attack. They also announced they would not be attending the march announced by COSEP, as they would not be leaving the university grounds. The “self-assembled movement,” movimiento autoconvocado Nicaragua,called for another march at the same time but with a different route than COSEP’s, stating that COSEP did not represent them. Vice President Rosario Murillo announced that the decree read by Ortega on Sunday revoking the social security reforms had been published by the government’s gazette, making it official. Approximately 70,000 to 80,000 people marched together to UPOLI, carrying Nicaraguan flags, chanting for the end of repression, and calling for justice for the deceased, detained, and missing. Students at UPOLI welcomed the demonstrators and demanded the resignation of several government officials including Daniel Ortega and Rosario Murillo. They announced a march from UPOLI to the police station in District 6 on Tuesday, April 24, to demand the liberation of the illegally detained students and civilians. Since Friday, families of the detained had been protesting outside El Chipote, the judicial assistance department. The massive march culminated with the removal of another “Chayopalo” [one of the big pieces of public art introduced by the Ortega family] in Managua. Students at UPOLI reported attacks by policemen dressed as civilians around 3 am. In the morning, detainees were released from “La modelo,” Managua’s penitentiary in Tipitapa, in groups of 15 or less along a remote road with shaved heads, barefoot, with 20 c$ (0.64 usd) in their hands. They described being tortured by policemen but aided by prisoners, who were consequently tortured as well. A journalist was also released in Leon. After trying to reach Managua for two days, participants in the peasant movement in Nueva Guinea, Rio San Juan, and Ometepe resorted to road blockades to support the protests. This movement joined calls for a national strike. The bodies of two missing youths suddenly appeared at the Institute of Medical Forensics (IML) in Managua after their families had searched for them at different hospitals. Ortega’s government began removing state-sponsored wifi from public parks. Sectors of the formal labor market resumed operations and city halls began cleaning up damaged roads. Around 6 pm, the Episcopal Conference of Nicaragua announced that they would mediate the dialogue between Ortega, the private sector, and other civic groups. At 7 pm, Ortega interrupted national television to accept the Episcopal Conference’s announcement. A week after the protests erupted, a sense of eerie calm arose in response to the promise of dialogue. Confrontations ceased; however, the death toll continued to rise as the bodies of students reported missing were identified. Bishop Baez, a key figure of support for protestors who was included in the mediation commission, stated that optimal conditions for dialogue should include prosecuting those responsible for the murders and other acts of violent repression. In a statement from students at UPOLI, the self-proclaimed “Movimiento estudiantil 19 de abril,” they accepted the invitation to participate in the dialogue as long as their safety was guaranteed during and after the meeting. Several retired and active political figures jockeyed to participate in the dialogue, including former military chief Humberto Ortega Saavedra, the liberal party (PLC), and Telemaco Talavera, president of both the National University Council (CNU) and UNA (National Agrarian University). A statement denying support for the participation of Talavera in the dialogue was signed by 160 faculty members at UNA, arguing that he represented conflicting entities. In the afternoon, demonstrators held a march to accompany the families of those still detained at “El chipote.” Several vigils to honor the victims of police repression took place nationwide. Anonymous, the world-famous hacktivist group, announced that they hacked several government websites in response to the repression against the Nicaraguan people. The website for congress was one of the hacked pages and stayed offline for a couple of hours. These interventions were widely celebrated on social media. Nevertheless, several of us were wary of the fact that Anonymous further legitimized the Orteguistas’ claim that foreign powers—i.e., the USA—are intervening in Nicaraguan affairs. The public prosecutor’s office announced that they will be investigating all thefts, injuries, and deaths that resulted from the demonstrations. Earlier that day, the Nicaraguan human rights association, ANPDH, publicly denounced President Daniel Ortega and Vice President Rosario Murillo before the prosecutors office for the crimes and perpetuation of violence against demonstrators. Later in the night, the Movimiento 19 de Abril announced that they had left UPOLI’s premises as they found several government infiltrators within their organization. In addition, they stated that they did not trust the investigation carried out by the public prosecutors office. Image: An entrance to the Polytechnic University in Managua during the occupation. How was the uprising organized? What were the causes of the uprising? There was no indication that this was going to happen, just growing silent discontent. The fire was ignited when the Sandinista Youth and motorcycle gangs attacked protestors and this confrontation was broadcast publicly. The INSS Protests in 2013. Activists established an occupation in front of the Institute for Social Security; police violently evicted them in the middle of the night. Corruption at all levels of government. Corruption through pacts between government officials and the upper-class investors. Corruption to support the Ortega-Murillo family’s concentration of power and wealth. The concentration of power and wealth, what we call authoritarianism, by controlling the General Assembly and the Electoral Supreme Council. Opening up little possibility for any parties (including left-wing parties) to run for elections. Undemocratic elections: no foreign supervision of local elections at the national and municipal levels. The elections are basically supervised by the Sandinista Party. There is evidence of people voting twice and dead people also voting. Lack of transparency on government investments and foreign aid (for example, Venezuelan oil money). There is little transparency or accountability in how government funds are used. Much goes to social programs, but other parts are assumed to go directly to the party. Increasing gas prices compared to Central America, despite our relationship with Venezuela. Poor investment in education. Only 5% of applicants passed the math admission test to apply to UNAN, the largest public university in the country. A political model based on dependency between poor communities and the state instead of critical participation and dialogue. This is called clientelism. Cooptation of Media. The government owns eight different television and radio stations and, as they recently showed, are known to censor and attack other independent media outlets, including 100% Noticias and Confidencial. Overall hatred towards the police on account of corruption, bribery, and police murders such as the Las Jaguitas case. Bribing traffic police is a local custom. The Grand Canal project, which gave a lot of power to a Chinese company; it was potentially going to displace indigenous communities in the Caribbean/Atlantic side of the country. This $50 billion project started with the legal infrastructure but was never actually built. No private sector accountability over the environment. Environmental laws have been relaxed in order to incentivize private investment. Harassment from Juventud Sandinista and motorcycle gangs (which were first implemented by Venezuela) towards protesters. The aesthetic hijacking of Nicaragua—for example, the “Trees of Life” and the new Party aesthetic color pallet. Institutions that should be neutral—such as the military, the ministry of education, the ministry of health, and the police—are pro-government. Femicide rates are high for rural women. The closing of women’s centers (comisarias de la mujer). Abortion has been illegal since 2006. Ortega has been accused of sexual abuse against his step-daughter, Zoilamerica. Despite all this, things were not so bad for the middle and upper class. Those sectors were pacified. The situation could be a lot worse. People could work in the private sector and draw benefits from the public sector. We have free education and free healthcare. They are not the best quality, but they are free and accessible to most. But the government completely underestimated the level of national discontent towards the FLSN. This insurrection united all these sectors around one feeling: we don’t like the government and things could be better. The trigger for all of this was not a right-wing conspiracy or right-wing funding. The student protests erupted simultaneously at UNA, UCA, UNI, and UPOLI on Thursday and by Friday these protests had grown to cities all over Nicaragua. The right wing only started to organize after they saw an opening in the dialogue that was going to occur between the students, the private sector, and the government. There is plenty of evidence of United States involvement in Nicaragua, through the “Nica Act” and the National Endowment for Democracy funding organizations in Nicaragua. But there is no evidence connecting that to the emergence of this protest movement. Who Are the Sandinista Youth? The Sandinista Youth is the youth wing of the FSLN/Government. They are known for wearing the very colorful white shirts with colorful slogans. They are the first responders to natural disasters, they are the ones who go to government events, and they are the ones who respond to any public protest. My father (a Sandinista Guerillero and then a major in the military) tells me that in the 1970s and 1980’s, the student movement were the ones debating theory and action: Trostky vs. Lenin vs. Mao vs. Castro vs. Gramsci vs. Carlos Fonseca vs. Sandino. If you were a student organizer at that time, you would be well-versed in theory and practice; you would also aspire to be a good student and an example of the hombre nuevo (“new man”), modeled after Che Guevara. During the revolutionary process between 1979 and 1990, the Sandinista Youth played a key role in the intellectual and organizational aspect of the Revolution. They were the youth wing of the government; they gave the Sandinistas a relationship with young people; they organized the Literacy Crusade. They were also in the military, since there was a draft. Since Daniel Ortega’s democratic victory in 2006, the Sandinista Youth have been the most visible sector that supports the Ortegas. They are the youth face of the government; they are organized very hierarchically; they no longer have the intellectual weight that the historical Sandinista Youth had. The government recognized that 60-70% of Nicaragua is between the ages of 18-35—this is an important demographic. The Sandinista Youth are convinced that anyone that opposed Daniel Ortega must be a right-wing neo-liberal who wants to overthrow the government. It was right to react against the neoliberal parties in the 1990s and early 2000s—but today, those parties have lost leadership and power, mainly as a consequence of divisions in the right wing and co-optation by the Orteguista party. After the events of April 19, the image of the Sandinista Youth is completely tainted. There are clear pictures of them attacking peaceful protestors, mostly students (not to mention 10 years of evidence of this occurring before). There are plenty of videos, photographs, and testimonies describing how Sandinista Youth attacked journalists, students, and peaceful demonstrators. I personally witnessed this myself in several protests on Wednesday, Thursday, and Friday. I believe that the Sandinista Youth are facing an existential crisis. They thought they were the largest youth movement in the country, but this is no longer true. They are meeting students and other young people who think very differently and are empowered in a completely unique way that is not related to party politics. The Sandinista Youth is hierarchical, and far from autonomous, by contrast with the student and autoconvocados (“self-assembled”) movements. The Sandinista Youth already failed to form an alliance with powerful anti-canal Campesino Movement, which was formed against building the Canal around 2013. Under the leadership of Francisca Ramirez, the Campesino movement entered Managua on April 28 in support of peace and dialogue and in solidarity with the student uprising. I have never been involved with the Sandinista Youth. They have tried several times to recruit me, but I rejected their cult following of Daniel Ortega and Rosario Murillo and their strictly vertical approach to power. They do have a very militant organization and language. Several friends of mine are a part of the Sandinista Youth, however, through their families’ historical involvement in the Sandinistas or through their government jobs. What is the relationship of the UNEN and the Sandinista Youth to the Student Movement? UNEN is the pro-government student union, which has chapters in each major university, mostly concentrated in UNAN Managua, the largest public university in the country. UNEN get their “street cred” from the student protests in the late 1990s, when they were protesting the neoliberal government of Arnoldo Aleman and Bolaños, who wanted to cut education funding. The demonstrators demanded that 6% of the National Budget go to education. But the participants in the 6% protests are no longer young. The current UNEN students have no experience in protests; they only have experience following orders and supporting the Sandinista Government. If you are a part of UNEN, you will receive benefits and scholarships—but those should be accessible to all, not just UNEN. It is well documented that whenever there is a pro-government event or demonstration, all the public institutions of the government must attend these events, including workers’ unions. They have lists; you are required to go, or you will lose you job or your scholarship. This is how they get hundreds of people to attend pro-government rallies. It is the same with voting: If you are a state employee or part of UNEN or of the Sandinista Youth, you must prove that you voted. The psychology of the Sandinista Youth and UNEN is “us vs. them.” If you are a young organizer but you are not UNEN or Sandinista Youth, you are automatically assumed to be a right-wing, CIA-funded traitor who wants to destabilize all the wonderful things that the government has created. This is one of the main flaws of the Sandinista model: their relationship with the people has been economic and political, instead of social and sustainable. They have created dependency instead of autonomy: clientelism. What made the Ortega government popular? The government keeps contrasting the current situation to the 1990s, which were a complete disaster for the poor and working-class. Neoliberal governments created new political and economic elites, ruling from the 1990s to 2006. In the 1990s, we had power outages, water outages, extreme poverty, and crime and drugs. The World Bank and the IMF created free trade zones, with maquilas(sweatshops), that were designed to modernize Nicaragua. After the revolutionary process of the 1980s, we also saw the introduction of casinos, fast food chains, call centers, malls, private resorts, cell phones… basically violent globalization. Since 2006, the government has created a stable economy via authoritarianism and political and economic pacts. Costa Rica is too boring and expensive, so nowadays most tourists are coming to Nicaragua. Now the government is afraid that tourism will decline, affecting thousands of jobs. Nicaragua experiences relative peace compared to the most dangerous zones in Central America (El Salvador, Honduras, and Guatemala). We enjoy this safety not simply because of our large police force, but because Nicaraguans migrate to Costa Rica rather than the United States, so we don’t fully participate in the dynamics around migration to the US involving the cartels. There are also very harsh border laws between Nicaragua and Costa Rica. Right now, a camp of Afro-Caribbean and Cuban immigrants want to enter Nicaragua so that they can make their way to the USA, but they are not allowed in the country, not even just for transit. The most celebrated act of the government has been constructing parks with wifi and rejuvenating the old downtown. These parks are painted with the multicolor government aesthetic, but they are spaces that can be enjoyed by all. Every weekend, you see thousands of people enjoying public spaces, which was unconceivable in the 1990s. How does this relate to the historical legacy of the Sandinistas? The error of the Sandinista Party is that they have created a dependency between the poor class and the government. You can only buy loyalty for so long; they needed to build social infrastructure but never did. The Sandinista Youth was supposed to do that, but they failed. The government supported poor communities by giving away free food and building materials. Their approach has always been hierarchical, vertical, and authoritarian. This is a big problem for new youths who don’t like being told what to do. There is no debate inside of the Sandinista Party. Sandino is a national hero from the 1920s and 1930s. His original platform was anti-imperialism, cooperativism, citizenship, and nationalism. Sandino was radicalized in Mexico, where he experienced the labor movement after the Mexican Revolution. He brought the Sandinista red and black flag to Nicaragua from Mexico after he met with Spanish Anarchists. In the 1960s and 1970s, Carlos Fonseca introduced Sandinismo as an ideology and movement based around a revolutionary strategy that did not include an industrial class—as Nicaragua had few industrial workers. In the 1980s, the FSLN held power; they introduced agrarian reform, the National Literacy Crusade, and a socialist model with a strong central government and a small private sector. Cuba and the Soviet Union were their chief supporters. At the time, the Contra War impacted the revolution. The Contras were supported by the USA, but they also included farmers who didn’t want to work in cooperatives and thought that the FSLN was hierarchical. The FLSN have changed the constitution; they have spent the last 10 years building their own infrastructure in order to hold on to control. These insurrections are a wake-up call to the government and to the Sandinista Youth. They no longer have control of the discourse and of the image of Nicaragua. The UNEN and the government have pointed at the right wing and at the MRS (Movimiento Renovador Sandinista, “Movement to renovate Sandinismo”), claiming that the MRS has infiltrated student groups and funded the protests. The MRS is a dissident Sandinista group formed in the 1990s. They have been running in elections without winning; their support is around 10%. In reality, the MRS only wish they had the kind of money it would take to fund the protests. I have several friends in the MRS; they are good people, and smart, but they still play party politics. The more existential questions are: What does Sandinismo mean today? Who speaks for Sandinismo? What still works about Sandinismo? Who owns Sandinismo? The FSLN? The war veterans? We have seen people trying to re-signify the co-opted image of Sandino. There has been a nationwide effort to paint blue and white all the Sandinista monuments that were originally painted in red and black. People are putting the Nicaraguan flag behind Sandino, but they are still respecting his image. This suggests that a lot of people want a National Sandinismo instead of an Orteguista Sandinismo. But this is just aesthetic, nothing political has emerged. We lack leftist critiques of Orteguismo. What does a left-wing anti-Orteguismo look like? Image: A vigil for those killed during the uprising. Again, note the flags. How has the private sector responded to the situation? We’ve heard rumors about how Roberto Pellas, Nicaragua’s first billionaire and head of Casa Pellas, the company that owns the upper class private Hospital, the car dealerships, the insurance and the banks, is positioning himself strategically in light of future negotiations. This is odd, since the Pellas families have benefited from the Ortega family being in power. But to say the least, the Pellas industry supports capitalism and further economic growth at all costs. I only see the upper class supporting stronger IMF influence. Nicaragua already survived 15 years of IMF and World Bank control through neoliberal governments. Everybody hated it. That’s the main reason Ortega won in 2006—people wanted change. I don’t see working class people demanding a return to neoliberal politics. The student movement has said several times that although the private sector is affected by the INSS reform, they do not represent the student movement. Right now, the majority of the people who have been murdered have been student protestors. No upper-class or private sector person has died as a result of confrontations with the Police. The bravery of the student protestors places them at the center of the dialogue. The government is including several other sectors in the dialogue (workers, private sector, representatives of free trade zones) in order to suppress the students’ demands. One of the chief things that I celebrate form these last 10 days has been how fast youth have been radicalized into taking a political position and forming political organizations. University students have organized themselves in assemblies and collectives. People have placed pressure not just on politicians but on artists and cultural producers. We are experiencing a new culture war. People are thinking beyond individual action, in terms of institutions and collective solutions. But again, horizontal methods don’t relate to progressive leftist politics—or do they? There are efforts now to create a radical leftist consciousness and organization. Several organizations and groups are promoting this. But efforts have not been targeted towards full infrastructure change. Right now, people want justice for the people who were murdered, hence the dialogue with the government. The main rhetoric of the movement has been “We must stay in the streets so that we don’t forget all the ones who have died.” Whatever comes out of this dialogue will not be enough, because the government will never give you the tools to overthrow it. Have right-wing groups attempted to co-opt the movement? Right now, the only right-wing group we are keeping our eye on is the PLC political Party, but they keep being booed out of marches and protests. No political party has attempted to take their own party flags to the demonstrations yet. The real right-wingers are the people from the private sector. The right wing in Nicaragua will not come from a nationalist ethno-centric movement but from private interests. I was shocked when I saw how many upper-class wealthy families were attending the marches. Of course those marches were not disrupted by the police; of course they did not encounter any violence; of course they were safe and offered a cathartic feeling of belonging to a national movement. I saw Piero Cohen, a Nicaraguan millionaire, shouting on live television about how Ortega had to be overthrown. Here is where we can see how opportunistic everyone has been. “Opposition” is such a plural and changing concept; the only thing all the opposition shares is opposition to the Ortegas. Nicaragua is an extremely Catholic Country, and somewhat conservative when it comes to LGBTQIA and feminist issues. The arguments and positions of the “opposition” have taken on a very nationalistic tone with a Christian inflection. Right now, we are seeing a nationalistic push against the Ortegas, but inside of this nationalism there are many different ideals that contradict each other. People are extremely suspicious of attempts to support and speak on behalf of the students. Everybody is attempting to co-opt these movements. Everyone wants a piece of the pie. People from every sector are organizing themselves and want to promote a dialogue that includes them. Everybody is sharing their disapproval of the government. The conditions have been created under which new leaders will emerge and try to represent movements. Not necessarily from the right wing, but whoever wants power. It is the task of the students and the self-assembled to not fall into this trap and to do a good job at having delegates and representatives that can speak on behalf of the organized majority. Who has the right to speak on behalf of the murdered students, who mostly came from working class backgrounds? To be honest, our right wing is not as organized in Nicaragua as in the United States or Venezuela or Brazil. They don’t attract young people. I think people are tired of party politics; we have seen the same talking heads over and over again for the last 10 years. People are excited for a new kind of leadership. But what also needs to be proposed is a new kind of method. The right wing was in power through the 1990s with Arnoldo Aleman and Enrique Bolaños. They set the ground for vicious neoliberal policies and created a new political and economic elite at the expense of the working class. Right now, Arnoldo Aleman’s wife is trying to take advantage of this situation to get more votes on her party. But nobody wants to talk about political parties at this point. I think populism is over here. The strongest actor that wants to co-opt the movements is still the state and the Sandinistas. They have already started to dress as civilians (without the colorful Ortega Shirts) and to wave Nicaraguan Flags instead of FLSN flags. The government has said in almost every communiqué and television that the entire uprising is a plan from the right to destabilize the country. This message is being multiplied at all levels of society. Consequently, the movements are doing their best at critiquing any “right wing” conspiracy. The interest of the United States through the Nicaraguan Investment Conditionality Act (NICA) has also been a concern. But people are not talking about it very much on the ground. A door has been opened, but we don’t know what’s going to come out of the other side—it could be a right-wing neoliberal subject or a radical leftist subject. But the Sandinistas and the MRS have co-opted all the leftists’ language. What does it mean to be a Nicaraguan leftist and not support the Ortegas? Or should the strategy be to support the Ortegas as a vehicle to get into more radical politics? There are still debates about this. Image: A diagram explaining the difference between anarchism and the other ideologies on offer in the marketplace of ideas. What are the sources of the horizontal values and structures within the movement? This all started with UPOLI, because there was no leadership in the protests; this all started when hundreds of people created Signal and Telegram groups to talk and find ways to help the protests without need of authority. And all of this works because this experience of politics is very different. It is more empowering, but it also takes more work. It has led to confusion and disorganization in some sectors. It does involve a lot of communication. We have no idea where all of these anarchist ideals came from: mutual aid, affinity groups, horizontalism, communes, occupations, consensus. It was as if they had been part of our collective unconscious but we had never had an opportunity to practice them. Practice came first, then theory. It’s not that people are openly reading anarchist literature, as much as I have tried. People just organized this way, and maintained this way of organizing through the whole week of struggles. No populist leader has emerged, only delegates and spokespersons. We have ideas of movements, and of secret meetings, but no authority or verticality. Still, our parents tell us that there is a cultural need for leadership. So we have conflicting models fighting each other. We have still been learning; there have been conflicts. For example, a group of activists leaked naked pictures of one of the UNEN organizers. This provoked the feminist movement to call out misogyny and machismo, and also the role of the church and authority inside student movements. The most stressful thing has been infiltration. Movements have been infiltrated by UNEN, the pro-government student union, who have slowly infiltrated universities like UPOLI and fomented disagreements within the students. But everything that we have learned over the past days is now part of our political imagination, our skillset, our language. These events created the conditions for us to experiment and practice these skills, and every day we are learning new skills. How do the events in Nicaragua relate to other struggles in Central America? Central American has been through a lot. Look at the Fuera JOH movement (which I also briefly experienced) in Honduras and the backlash against the “ultra-conservative” movements in Costa Rica right before their elections. But no elements have connected these. We were keeping a close eye on Costa Rica because we were afraid that the “ultra-conservatives” would influence and inspire Evangelicals here in Nicaragua. So far they have not. Honduras, Nicaragua, and Costa Rica are three very different countries. Honduras, El Salvador, and Guatemala have more in common; Nicaragua is its own bubble. In terms of anarchist presence, Costa Rica, El Salvador and Puerto Rico have by far the largest concentrations of anarchists. But in my experience, we experience very little solidarity and political exchange with these countries. There is more cultural and academic dialogue than political communication. In 2006, Sandinismo came to power as part of the “Pink Tide,” a wave of electoral victories for leftist parties throughout Latin America. Yet surprisingly, we have very little communication with the rest of Latin America. There is a cultural frontier between Panama and Colombia. We sometimes hear something about the student movements in Argentina and Chile or indigenous resistance in the Amazon. But in terms of organizers getting together and exchanging strategies broadly between Central American or Latin American countries, it is very rare. We might have more affinity to Mexico than to some of the previously mentioned countries, but still, it doesn’t come through as much, and of course the more upper-class sectors of the population have their eyes and ears and hearts aimed at the United States. Many people draw parallels with Venezuela and Nicaragua. A lot of people in Nicaragua have a strange relationship to Venezuela. We do owe our “sustainability” to Venezuelan aid, in return for which we send meat back to Venezuela. Ortega and Maduro have been compared a lot, even Ortega and Chavez. But again, the context is very different. Unfortunately, we still need to develop an intersectional analysis inside of Nicaragua and outside of Nicaragua. We have been too busy figuring things out on the ground, we have not had a chance to reflect on our situation in an international context. What can people elsewhere around the world learn from this movement? This insurrection occurred so fast. It was literally overnight. The images of the police and the Sandinista Youth beating up peaceful protestors resonated across the entire country. It was the straw that broke the camel’s back. Never underestimate the solidarity that can come through students. Never underestimate the level of spontaneous organization that can emerge between friends, family, and strangers. I am amazed at how quickly people organized themselves into affinity groups and cells. I am amazed at how horizontal all these efforts and movements have been. Understand the local conditions in which you live; always consider culture as a factor in your organizing. What happens will follow cultural patterns, but it will also redefine them. Take these moments of crisis to learn new skills and make new friends. Take chances. Experiment. Address your struggle to your own local conditions. Doing so will help you see into the future and understand the present. In Nicaragua, since Ortega, people have claimed that things could be worse compared to our history, but you must be able to also show how things can be better. In the case of Nicaragua, it seems that the past (the revolution from the 1980s) has hijacked the present. So it’s the task of new movements to analyze the 1980s and 1990s, in part by talking with the generations that experienced them. The question of “the people” as singular has also been contested. The people as plural is richer but at the same time more complex. We need to attack the center from different places, at different intensities, and at different levels. There is no one strategy; the decentralization of groups and efforts into smaller factions concentrates energy in very different places. We need to study the countryside and see how it operates—and the universities, the Sandinista youth, the private schools, the popular markets, the neighborhood, the workplaces. You can’t be involved in all of those spaces at the same time, so decentralizing attacks and conversations and critical reflections helps everyone. We must expose all the shortcomings of the right. Their political platform, their ideology, their organization, their power structures—and connect them to race, class, gender, history, geography. We are still figuring this out. Right now, we are trying things and responding to the reactions. Things need to happen in order for people to take positions. We are reacting to the government, but we are also providing material for the government to react to. We need to map the right, center, and left players—to critique them, to expose them. The same goes for the supposed neutrality of institutions. No matter what happens in the future, what the government does, how the private sector reacts, how the students movements unfold—over the last week, all the students and organizers have grown tremendously. We have learned so much, failed so much, but also won incredible battles. All these things we cannot unlearn and we cannot unsee. We will never unsee how hard the government tried to cover up its failure. We cannot unsee. The situation in Indio Maiz is more complex than just government ineptitude. As an organizer inside of the #SOSIndioMaiz, I met with Rama and Criol indigenous leaders and with Park Rangers that protect Indio Maiz; they tell a story of racism, illegal cattle ranches, government and private interests, concentration of power and territory via the military, and more. The government department that is designated to protect its natural resources has not replied to any of the lawsuits that have been sent for the last five years. Indio Maiz was not just about the fire. It was about the fact that the government benefits from illegal wood extraction, illegal cattle ranches, and private sector monocrops in indigenous territory. Indio Maiz was about the racist dynamic between the state and local indigenous governments. Indio Maiz was about the fact that it is very difficult to study ecology or environmental resources management in Nicaragua. Indio Maiz was about the Grand Canal. Indio Maiz was about the relaxed environmental policy regarding private investments and construction. Motorizados, motorcycle gangs. Protesters were repeatedly attacked by these older men wearing helmets and utilizing baseball bats, metal bats, rocks, and other weapons.